The memorial fund set up in the name of Princess Diana has been forced to freeze its funds because of a costly legal battle with a US souvenir firm. It puts 500 jobs at risk and could affect grants to its more than 120 beneficiaries. The fund, set up to help the causes Diana campaigned for, has now approached other charitable bodies in an attempt to keep its projects going. 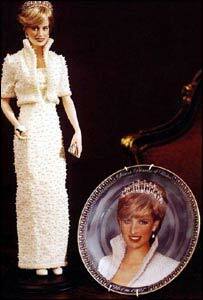 It is being sued for more than $25m (£15m) by US-based company Franklin Mint which produces Diana merchandise including dolls, plates and jewellery. The company claims the fund's unsuccessful 2002 attempt to sue it for making products bearing Diana's image was malicious. On Friday the memorial fund confirmed it was "legally obliged to freeze not only new grants but payment of existing grants". The fund's chief executive, Dr Andrew Purkis, told the BBC about £10m was needed to honour existing commitments. The fund is in the process of warning beneficiaries about the crisis so they can make contingency plans "to cope with such an unexpected and painful blow". It is also trying to find a way to make sure that a freeze on new grant giving is only temporary. Dr Purkis said: "If this doesn't work, it means that unfortunately and terribly wastefully, a lot of wonderful projects may have to close while the fund remains in a frozen state." Dr Purkis said: "We are simply not prepared to see this inspiring work destroyed. "There is no finer memorial to Diana, Princess of Wales, than the humanitarian work continuing in her name, and through cooperation of fellow charities and grant-givers we intend that it will all reach fruition." The organisations supported by the memorial fund include bodies helping vulnerable young people, prisoners' families, refugees and asylum seekers in the UK. It also helps charities trying to protect people from landmines and ease the suffering of the terminally ill in some of the world's poorest countries. Lucy Gampell, director of Action for Prisoners' Families, said it would be "catastrophic" if its grant - a quarter of its total budget - was lost. She said staff had been put on reduced working hours and that a number of services could be cut. Ms Gampell added: "We've got to be very strict about what we can and can't do over the next few months because it's a huge amount of money to lose." In June 2002, the memorial fund lost an attempt to prevent the Mint producing souvenirs bearing Diana's name and image, leaving it facing a £4m legal bill. The fund and Diana's estate had argued the Mint's production of a "limited edition commemorative plate" soon after her death in 1997 violated their "exclusive rights". The action was thrown out after being labelled "groundless and unreasonable". Now the mint is counter-suing, claiming punitive and exemplary damages. Last year it accused the fund, Diana's sister Lady Sarah McCorquodale and her mother Frances Shand Kydd, of malicious prosecution. Lady Sarah and Ms Kydd are executors of Diana's estate. The Mint says that in 1998, Diana's estate "decided to run a public relations campaign". It says the estate launched legal action against it "on the theory that a high-profile lawsuit must be pursued to send a message to others". But the company claims the action was "merely an effort to damage the Franklin Mint's sales efforts, embarrass it and sully its reputation". Commenting on the legal action the fund took, Dr Purkis said: "At the time, the trustees were doing what they thought was right for the memory of the Princess and followed legal advice very carefully. "It's only with hindsight that it is clear it was a mistake." "The Charity Commission says it will have a devastating effect on organisations"